The eleventh Ottawa-Gatineau Gold Medal Plates, held on Nov. 7 at the Shaw Centre, was a grand night of partying in support of Canadian Olympic athletes. 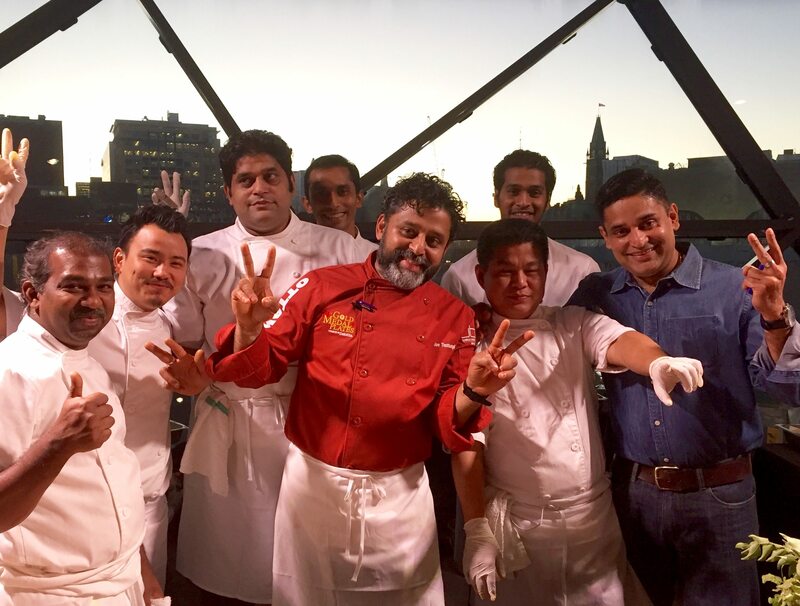 It was also, of course, a very fine cooking competition, one that brought together ten of the National Capital Region’s finest chefs. As one of the judges, I ate incredibly well this year — the dishes were as inventive, well-executed, and delicious as I can remember. It was also a fierce competition, and the judges’ deliberations took longer (and seemed louder!) than usual. At the end of the night, the podium was occupied with chefs Marc Doiron from Town, Jamie Stunt from Soif, and Joe Thottungal of the Coconut Lagoon, taking the bronze, silver and gold medals, in that order. While, seven of the ten competing chefs chose to work with fish, the one that swam to the top of the heap came from the little Kerala restaurant on St. Laurent Boulevard, which is currently wrapped in construction paper. The ten-year-old Coconut Lagoon is in the midst of growing its small space. And after last night’s win, I would suggest more tables are a solidly good idea. Chef Joe Thottungal soaked BC halibut overnight in seasoned green mango juice, then slow-poached the fish in canola oil infused with garlic, shallots, and a profusion of Kerala spices – green cardamom, cloves, cinnamon, star anise, fennel seed, and white peppercorns. It arrived topped with what Thottungal described as “Kerala curry crumbs”, a mix that included ginger, curry leaves, and smoky black tamarind, splashed with coconut milk, then dehydrated. The result? The sauce became a super-charged brittle, lending flavour, crunch, and smoke to the moist, fragrant fish. To the side of the halibut was a mushroom aviyal (a vegetable side dish seasoned with curry leaves and coconut oil, famously served at the Onam Sadya feast). The orange dobs on the plate were a red lentil-ghee emulsion; the green, a spinach and coriander sauce. Thottungal finished the dish with garnet-coloured ‘caviar’ pearls of beet juice spiked with ginger. 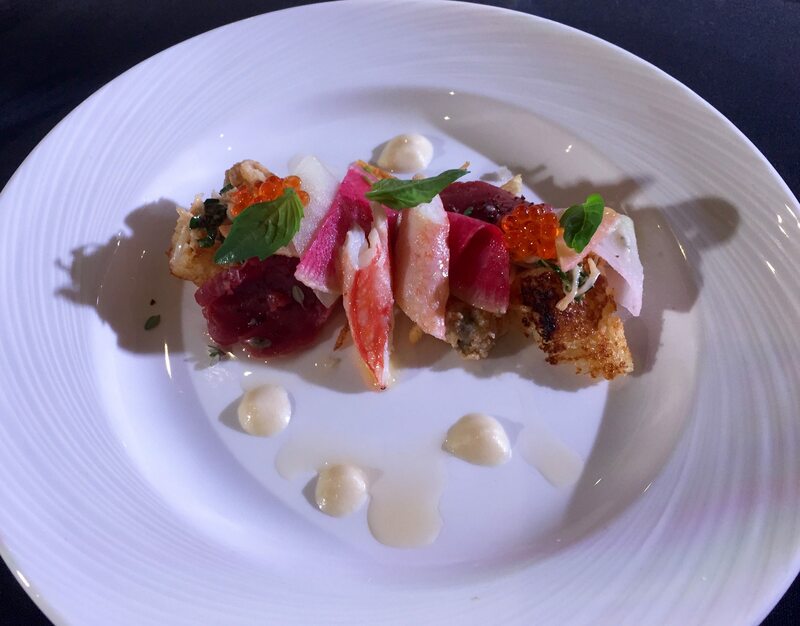 Paired with the winning plate was the 2015 off-dry Riesling from Huff Estates, which the judges found a superb match — the sweetness and tang, the mango and mineral notes, greeted the dish in a loving way, and completely refreshed the mouth. Taking the silver medal at this year’s culinary competition was the winner of the 2013 competition: chef Jamie Stunt, formerly of Oz Kafé and now at Véronique Rivest’s Soif bar a vin. As is the way of things at Soif, the dish was built around the wine – a Gaspereau Valley, Nova Scotia 2009 Méthode Classique brut from Benjamin Bridge. (And, as it happened, it was also the wine awarded ‘Best in Show’ by the GMP wine judges, led by David Lawrason.) “We really like raw, briny things with sparklers,” Stunt explained to our judges’ table. He had looked further east of the Gaspereau Valley to source the Fogo Island crab that was the star of his plate, mining its richness in four distinct ways and pairing the crab with bison, presented as a carpaccio rimmed with bison jerky powder. It was an odd marriage, but one that worked incredibly well. Stunt had pickled quince and fashioned a quince vinaigrette; delivered a bit of crunch with a fried oyster; included a hit of spiciness with radish; and finished the pretty plate with salty pops of brilliant orange trout roe. 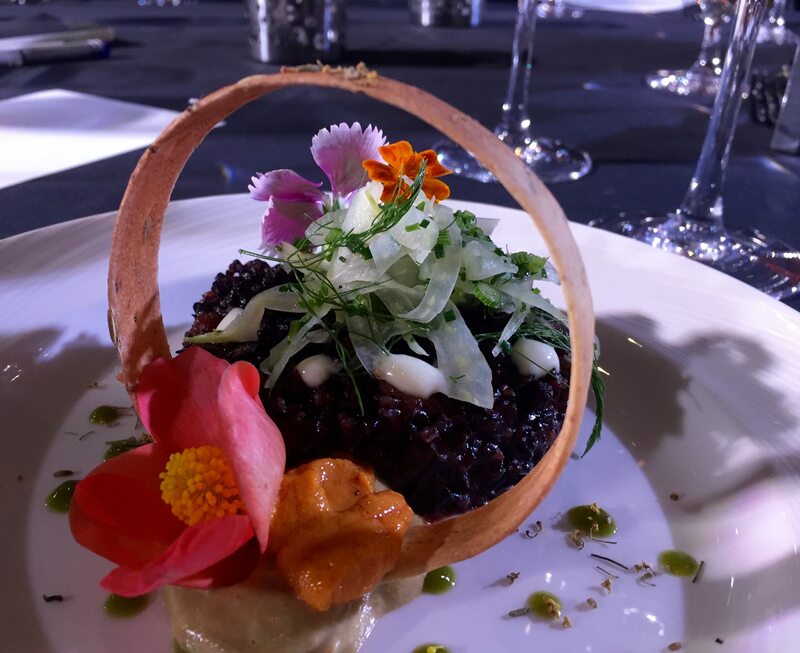 Chef Marc Doiron created a unique risotto dish using black rice. The salad topper featured ribbons of fennel and the fennel tuile was anchored to the plate with sea urchin mousse. Our bronze medal went to chef Marc Doiron of Town restaurant for his ‘Forbidden Risotto’. 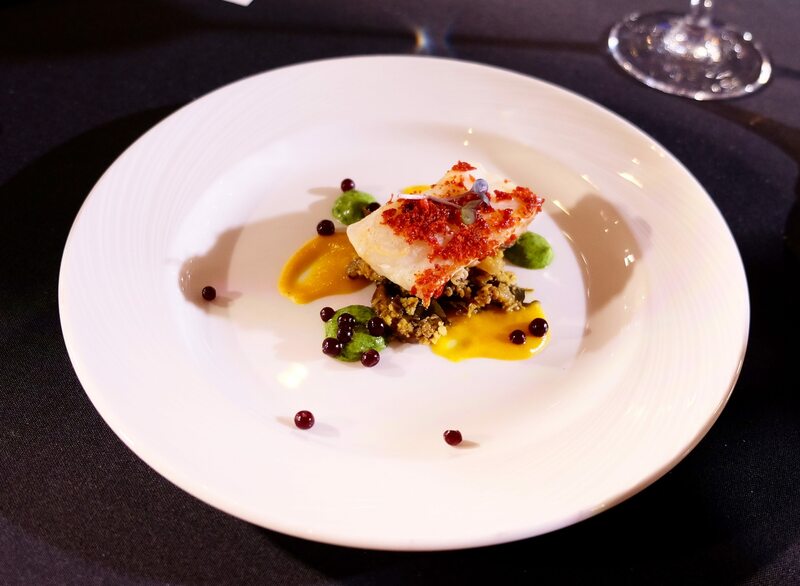 Using Chinese black rice (called ‘forbidden’ or sometimes ‘emperor’ rice), Doiron had made a risotto of sorts, featuring powerful paella flavours. Embedded in the purplish-black puck of rice were chunks of spicy chorizo, juicy shrimp, and crackling bits of socorrat (a fancy word for toasty, crusted rice), the whole flavoured with gochujang, the essential fermented condiment of Korean cuisine. A salad topper — featuring ribbons of fennel compressed in Sambucca, lemon juice, and dill fronds — was a delightful energizer to the earthy-flavoured rice, as were the green dots on the plate – a gelée of chives, basil, and cilantro. Anchoring a fennel tuile – a thin, brittle cracker in the shape of a ring – to the plate was a mousse of sea urchin. A wee garden of edible flowers prettied it all up. For the wine, Doiron turned to the 2014 Pinot Gris Cuivré from Stanners Vineyard in Prince Edward County, the only straw-bale-constructed winery east of the Rockies, and a good match to the dish! And so it’s on to Kelowna for Chef Joe Thottungal, where he will compete at the Canadian Culinary Championships next February. The Gold Medal Plates pan-national gastronomic campaign continues through next week, with Winnipeg and Victoria the only two remaining cities. My thanks to my fellow culinary judges: to ‘Hill Chef’ Judson Simpson, executive chef of the House of Commons, chair of the Canadian Culinary Federation, and international culinary judge; to columnist, television host and award-winning cookbook author Margaret Dickenson; to culinary instructor, food stylist, writer, and seasoned TV cook Pam Collacott; to the president and owner of Thyme & Again Creative Catering and Take Home Foods Sheila Whyte; to last year’s Gold Medal Plates winner (and two-time Canadian Culinary Champion) chef Marc Lepine of Atelier; and to Gold Medal Plates culinary advisor, Toronto-based writer and editor James Chatto.